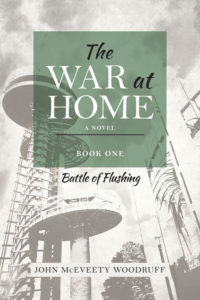 By John McEveety Woodruff *Note: The following contains spoilers for The War at Home series* The War at Home, like many projects, started out as a completely different concept. When folks ask me how long the trilogy took to write, I usually say ten years, and in its current form, that is the truth. But it really goes back twenty-five years. At that time, I was busy courting my now wife of nineteen years. And as happens in courtships, lovers tell each other their lives. In the first courtships of one’s life, the stories cannot be very many; by middle age, however, the process can be quite involved. It was during this process, at the latter end of my forties, I came to realize I was actually framing out the construction of a fairly complex tale. When I discussed this with my then girlfriend, she agreed there was something there, and it should be titled Seduction Stories. At first I decided to try to work more to the literary side of the craft. I also decided it had to be autobiographical fiction. I had tried what I call “pure fiction” and I did not feel comfortable. Making entirely everything up is for braver souls. I was much more at ease with events from my life. I chose to use fiction because I did not want to get mired in whether there was a question of truth being compromised. James Joyce was once quoted of having said, “Memory is the beginning of fiction.” I don’t think that concept can be more simply, and therefore beautifully, put. One of the main “literary” ingredients would be that I would jump around in time. So, over the ensuing years, my writing project became this novel of tales from a life. I found, too, that I was more comfortable telling it in first person. However, along the way, there were times when I slipped out of those chains, and introduced a third person perspective. I broke other rules, too. If a moment within a story recalled by association another moment from a different time, I would go off on that tangent until it was exhausted, and then return to the original moment. I firmly believed I was on the right road. I believed that in order for the work to be interesting, it had to be fabricated in this way. 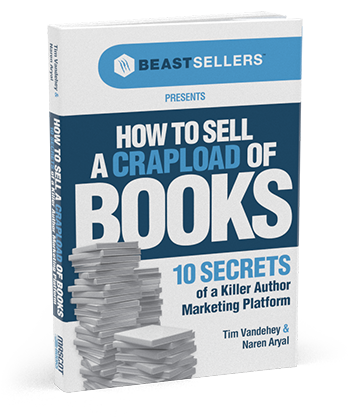 In this mode, I produced around five hundred pages. By the time I had reached this point, I felt it was time to get really serious and finish the thing. How better to do that than to apply to artist colonies? I was convinced that a month somewhere in the woods, working on it eight hours a day, would be all I would need to bring it to life. For a letter of recommendation, I am fortunate to have as a friend a person who is in a position of power in academia in New York City, specifically creative-writing academia. He is a very busy man. Regardless, he generously asked to see excerpts. After about a week, he called. Without beating around the bush, he simply told me it was not ready for a colony. In as friendly manner as possible, he suggested that I workshop it. I had not expected that reaction at all. I think he could hear that in my voice. He described a number of the opportunities available in New York City, opportunities that would fit my budget. That was the turning point. There would be no birthing of Seduction Stories. In fact, by my second class at The New School in a course titled Novel Workshop, I knew Seduction Stories was stillborn. I knew the form I had adopted was wrong, that I was not that kind of writer, that I had been kidding myself. I knew I would have to tell the story in a basically chronological fashion. I would have to trust Joyce’s comment and have faith that the fiction would come along once the memories started flowing. I had to be confident that along the way, the tale would discover itself, that the artifice would emerge without being forced. And that is exactly what happened. A good example is that near the end of the first book, when the mother of the family dies, I mourned the fact that one of the more singular characters of the story was gone. But I refused to give her up. So I decided to follow her into the afterlife. Thus, a second narrative was born and was developed along with the original narrative until the final page. What intimidated me most was that when considering the scope of the story, what it would encompass, this form of the project would be a lot longer than the five hundred pages of my first failed effort. But it would be a relatively straight narrative. This was important, because with so much material, it had to be reader friendly. At the school, the biggest fear was sharing the work in progress with other writers. Until now, I had avoided that. Another point of discomfort was my age: I was more than twice the age of any of the other souls in the class, possibly including the teacher. But I quickly got past these hurdles, in large part because my work was well accepted. That was a confidence booster that I had not considered, and that, along with other positive reactions through the years was all that mattered. Among the many things I carry with me from that experience was how impressed I was by the teacher. With over twenty students, each week he carried in and out of class a dictionary-size sheaf of work. His comments on the work were always revelatory, and his assignments were always creative in a way that woke up potential in the work that the writer might not be aware of. One of my favorite examples of that was the very final assignment: write the ending of the work. I would not be surprised if that is boilerplate in courses like these, but I thought it was quite clever in that it forced the writer to round out the construct of the project. It certainly helped me. 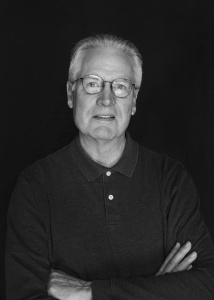 John McEveety Woodruff started the three-volume series The War at Home ten years ago. Mr. Woodruff has published poetry in The Bad Henry Review and short stories in Outerbridge. He has written two librettos for operas. The first, “Meriwether: An American Opera” was written with composer Jim Lahti and is about the final days of Meriwether Lewis. The second, “Regina,” was written with composer Douglas Thompson and is about a family divided over the 1935 riots in Regina, Canada. The cycle of poems titled Of Death and the Planets has been set for two singers and chamber ensemble by Mr. Lahti. Mr. Woodruff lives with his wife in Jersey City, New Jersey. 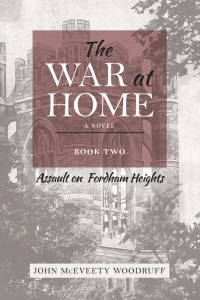 Get your copies of The War at Home series here: Book three coming soon!